A new commanding officer took command of the amphibious assault ship USS Bonhomme Richard during a change-of-command ceremony. Rear Adm. Cedric Pringle, commander, Expeditionary Strike Group 3, the presiding officer at the ceremony, praised McCullen for his dedication and diligence while the ship was in his charge. McCullen took command of Bonhomme Richard while the ship was forward-deployed to Sasebo, Japan. Under his guidance, the crew completed the biennial U.S.-Australia bilateral exercise Talisman Saber 17, the 37th iteration of the Thai-U.S. co-sponsored exercise Cobra Gold 2018, and the biennial combined amphibious exercise Ssang Yong 2018. He also led the homeport change to San Diego, taking the ship from the U.S. 7th Fleet to the U.S. 3rd Fleet area of operations. LeBron served as Bonhomme Richard’s executive officer from April 2017 to Sept. 2018. LeBron enlisted in the Navy in 1989. 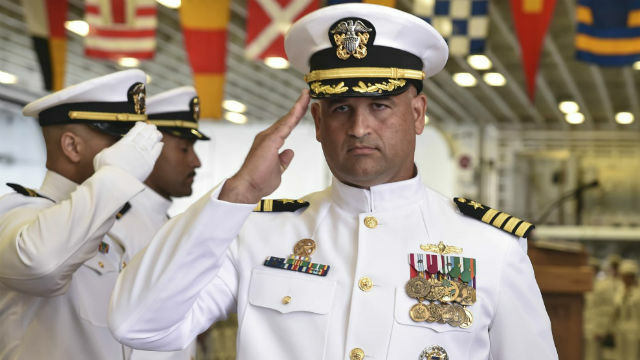 He rose through the ranks as a submarine Quartermaster to earn a commission as a Surface Warfare Officer. LeBron’s previous commands include USS The Sullivans, USS Milius and USS Benfold. Bonhomme Richard is the third vessel to carry the name and its historical legacy, and the sixth ship of the Navy’s Wasp-class amphibious assault ships. Its mission is to embark, deploy and land elements of the Marine landing force in amphibious assault operations by aircraft, amphibious vehicles or any combination of these methods, as well as provide humanitarian assistance.